I've been field testing some of Fred Bowen's Colt SAA Fixtures. Today I used his newest, the Bowen SAA Ejector Rod Housing Fiixture. 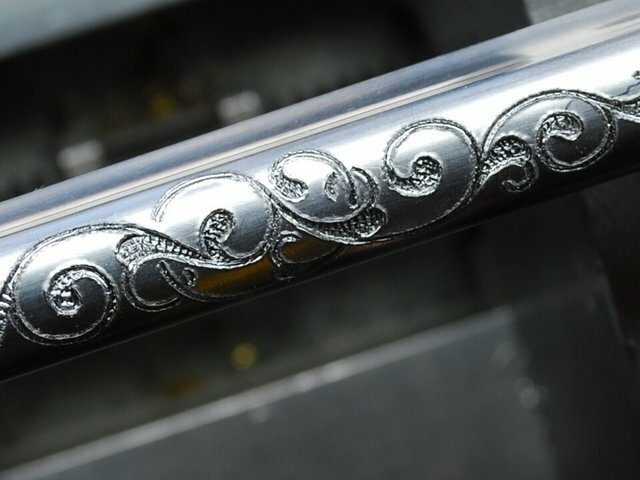 If you've engraved a Colt SAA you surely know that the ejector rod housing (ERH) is a tuff little critter to hold and engrave. The ERH part is all about curves, much like a barrel, and it is hollow, open on the bottom where the ejector slides, and it will deform/crush if enough vise pressure is applied. 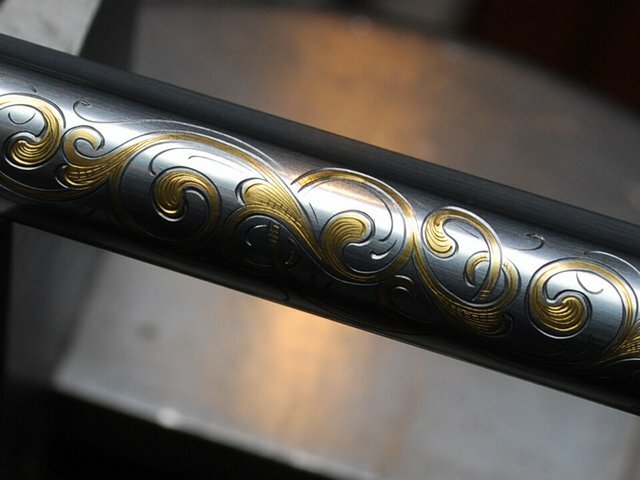 Worse of all, the diameter is only 3/8"
The following photos were taken today as I worked my way through a SAA rod housing that was to be engraved and inlaid in gold. You can see Fred's design for the holder in photo #1. The end peices have 3/8" pins that fit in most engraving blocks (this one is my LeTourneau) and there is a steel rod that extends from one side to the other and through the center of the housing - that eliminates vibration and supports the hollow ERH. 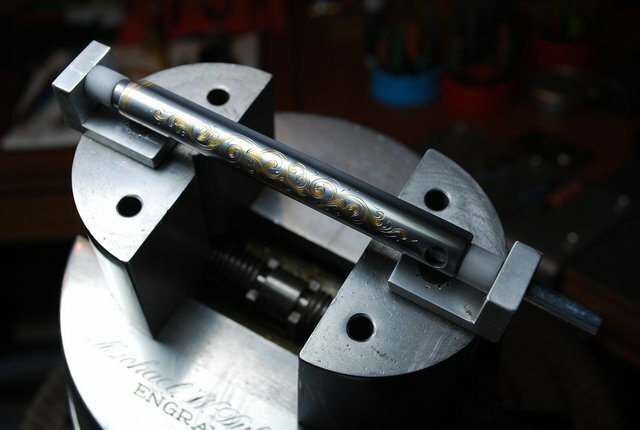 There are nylon washers at each end that allow the engraver to tighten the block enough to hold everything securely, but to also allow movement (rotation) of the housing as the part is engraved. Next, the gold inlay areas are excavated and burred up to accept gold wires. This process, and the subsequent setting procedure, is somewhat less than "delicate," so I was very pleased that my Bowen Fixture held everything tightly enough to do the excavation, burring and inlaying...I experienced no vibration or movement throughout the process. And, finally, here is a closeup of the finished work...so you see, my friends, engraving just gets easier and easier all the time. But I must qualify all of this by admitting that I did all of the work with my PalmControl - that's the real first step to engraving success! You are right, those things are a bear to work on. Does he have other SAA fixtures? How much? How do we get in touch with him? What do you use for holding SAA hammers? While I'm here, I might also say that some of us would to see some similar photo detail of how you do your inlay scroll and floral - it's very delicate, creative and beautifully designed. hi Mike .. to hold my hammers i use a product called cerasafe . i set the hammer into it and when it hardens i hold it in my vise . on my inlays i inlay my leafs first , when you under cut the whole scroll you take a chance of destroying the under cut you made on the spine , so i only under cut the leaf first .. here are some photos of how i do it also some photos of the jig i use to hold the ejector tube and barrels . no problem cutting with this jig .. Thanks Ron - your methods and mine are somewhat the same, although I think that yout leaf inlay procedure makes more sense than using wires like I do. Yes, we should get together and spend some time at the bench trading skills. Maybe next Fall will be a good time - I'll put it on my list. Great following along with you guys. Great selection of photos Mike and Ron.